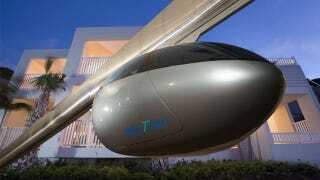 Tel Aviv is set to begin construction on the world’s first magnetically levitating skyTran system of mass transit. Which is awesome because it's fine time that our cities started to look the way scifi says they’re supposed to. As Design Bloom reports, Tel Aviv just appointed US consultancy firm Jenkins Gales & Martinez to oversee the introduction of the revolutionary technology. The system was developed with the help of NASA and the private company skyTran. The system, dubbed “the physical internet”, is designed to reduce urban traffic congestion. It will offer a practical alternative to cars — one that’s less expensive, greener, faster, and more comfortable. Guided by rails positioned 20 feet above the ground, the personal two-seater pods can be called up via website or mobile apps. Each pod is powered by electric currents running from above. Magnetic levitation, or maglev, is enabled by magnets in each pod and an induction coil within the skyway; minimizes friction, resulting in a quiet and smooth ride. Each pod will arrive almost instantly after being called up and will provide point-to-point service. Boarding platforms will be spaced such that the average distance from a hub to any point in the area will be within one quarter mile. When boarding and discharging, pods will use a side ‘acceleration line’ to avoid interfering with flowing traffic. The system will be modular in nature, allowing for easy construction and a high degree of scalability. Each pod will be constructed from composite materials, and will be lightweight and easily supportable. Fares will cost just slightly less than a cab ride. Other countries considering SkyTran include India, Indonesia, and Malaysia. Now if they could only build us a flying car. Terrafugia&apos;s revamped flying car should be ready by 2021. No, really. Actually, what we really want are those glorious Skylines from Bioshock Infinite. All images courtesy skyTran.us;via DesignBloom.